I wanted to share more of my crafting with you, so I have decided to start a monthly paper craft kit. I will be selling my kits @ my Etsy shop. That way, you can shop on your time. I will be posting a photo the kits here, each month around the 15th. 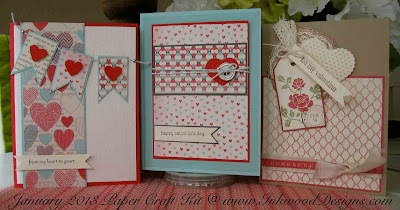 Supplies used to create this paper craft kit are from Stampin' Up!. 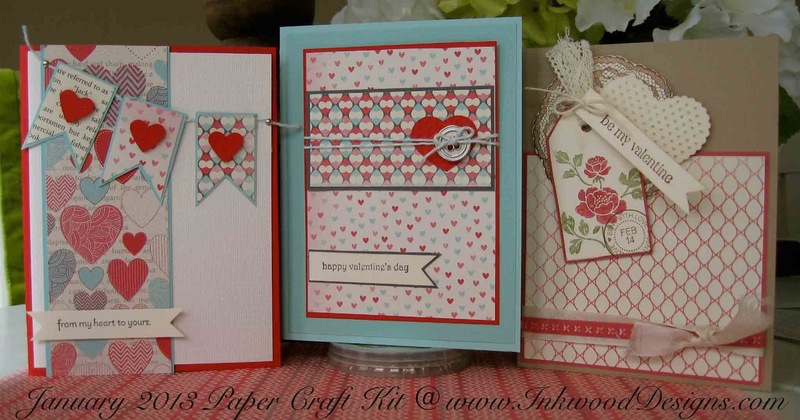 I have created three different, but very pretty Valentine's Day cards. You can also use these cards for an Anniversary, a wedding, or even an engagement. In the embellishment bag you will also find a rose-pink heart doily and a small cream fabric blossom. I have added these two items as a 'surprise'. The 'ticket' on the embellishment bag was adhered with foam tape, so you can remove it, and use it on another project, or add it to one of the cards. Complete directions are included in the kit, along with a photo of the finished cards. These cards are easy to assemble. Click HERE to purchase this card kit. Thank you for looking. If you would be interested in a specific kit, please leave me your suggestions. You never know, your idea could be the inspiration for next months paper craft kit! Labels: Amore DSP, Gossamer Lace, metal button, paper craft kit, seam binding, textured cardstock. You're very creative. This all looks like so much fun. I would say I haven't made anything in a while but actually, that would not be accurate. I haven't made anything out of paper would be more accurate. I've been spending more of my time sewing so I haven't been mixing up materials as much but I like doing it. It produces beautiful things, gets great results. Thanks for sharing your examples and ideas.